Prior to June of 2002, the emerald ash borer had never been found in North America. It was first discovered in southeast Michigan and has been spreading ever since. On June 9, 2006 the emerald ash borer was discovered in northern Illinois and has been moving south every year. During 2012, a confirmed infestation was found in Marion County, IL and recently (May 2015) the emerald ash borer has been confirmed in the St. Louis, MO area. The emerald ash borer can kill ash trees within two years after an infestation. 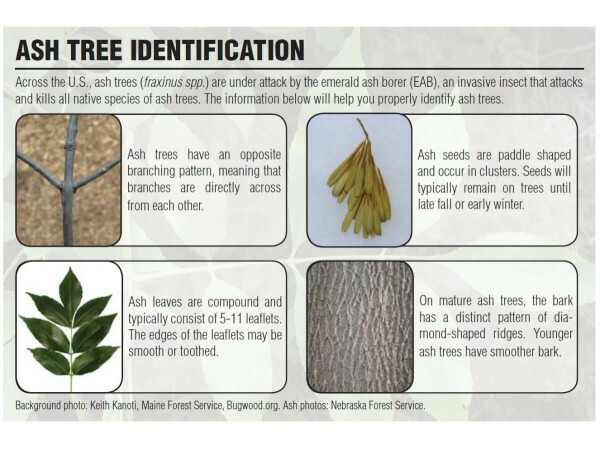 Making matters worse, ash trees usually do not even show symptoms until at least 1 year after an infestation which can be too late or results in significant die-back of a tree. At TurfGator, we have been monitoring this devastating invasive pest for several years, and in a proactive approach, knowing that healthy tress do not show early signs of infestation we started offering preventative treatments in 2013. After significant research and advice from industry experts and state authorities, we chose to offer our customers an annual basal trunk spray application which is non-destructive and very effective in comparison to other treatment options. When sprayed on a tree’s trunk, the insecticide will penetrate through the bark into the tree’s vascular system which is transported upward to where the emerald ash borer feeds. This method has been proven to provide systemic pest control of the emerald ash borer without invasive damage to a tree. State Campaign – “Do not move firewood – Help stop the spread of the Emerald Ash Borer (EAB)” – You may notice public billboards with this message, this is because the Emerald Ash Borer is spreading at an alarming rate to new counties and new states every year. As with many trees that have died, people tend to cut up the wood for the use of firewood. However, in the case of ash trees the Emerald Ash Borer can still be feasting on the tree underneath the bark. Moving the firewood to a new location can allow the Emerald Ash Borer to emerge from the log and now spread to a new area. Currently, Illinois is a Federally Quarantined state by the United States Department of Agriculture. For more information on EAB detection and a map of confirmed infestation areas, please click here. The insecticide application is required only once per year and needs to be applied during the month of June. As a full-service ornamental tree & shrub care provider, we provide the service of pruning and can provide this service at anytime during the year. Proper pruning can maintain overall health, improve the quality of blooming flowers, restrict unwanted growth. Mulch adds aesthetics with a uniform color and gives any landscape area a finished natural look. A mulched area conserves water by preventing evaporation, lowers the soil temperature during the summer and builds beneficial organic matter. We offer Pest Control Services operated under the company name of The Pest Guys, which is State licensed by the Illinois Department of Health. We offer several pest control solutions to keep those unwanted pests away like mosquitoes, ants and spiders.